Seals live in large groups. Therefore it may seem chaotic from an outsiders point of view. Yet they are very happy and content in their larger groups. In fact, this is one of their primary defenses against predators. It is important to understand that what goes on socially among seals depends on the species that you are talking about. What you will often find when you further observe these large groups is that there are quite a few subgroups within it. The seals form a social hierarchy that takes place within those subgroups. This is how order is maintained and how they determine their place in the group. Males often have the most power and those that are the strongest are dominate. This is very true during mating but also holds true the rest of the time. This is why they are often challenged by younger males. The females are less likely to be aggressive with each other. They are very social when it comes to the care of their pups. This starts from the moment that the pup is born. They can become aggressive during that period of time if other pups are too close or other females try to get too close to their young. In other species, it is the age of seals that seem to dictate the social structure. Those that are young and able to best protect the group are in charge. As a seal gets older they will be challenged by the younger ones. The females do have some authority but most of it in on the shoulders of the males. They are the ones that decide if the entire group will move for food or when their natural habitat has been drastically compromised. Generally, all it takes is for these dominate males to start the movement on their own. Then the rest of the group of seals will choose to follow them on their own. It is believed by many researchers that there are layers and layers of social structures found within a group of seals. Many of them aren’t fully evident though unless you carefully examine the group as a whole for long periods of time. It is interesting to see how the social structure of a group of seals shifts too. When a male has successfully changed one of the dominate ones the power will change hands. When one in charge dies or large numbers of seals die due to an illness the entire structure of it will change dramatically. 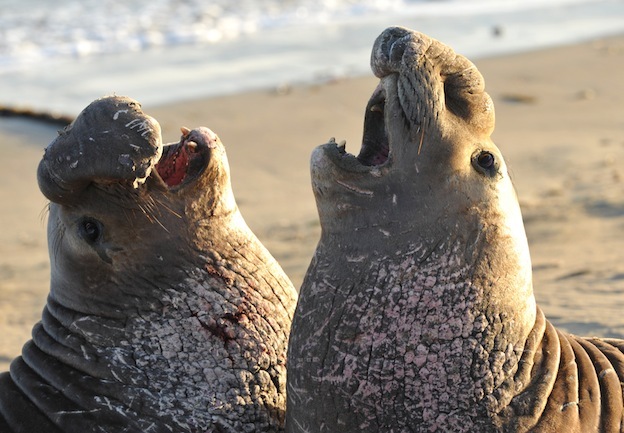 It is also believed that small cliques can develop in seal social structures. These have nothing to do with power or dominance but just social interaction. It is very similar to the way that groups of people will gather together. Seals in these types of social interactions may hunt together, sleep in the same group, and even relax in the sun together. The confines of such groups are very loose though. Therefore the seals can move around and by a part of several of these little cliques throughout the entire group of them. There is still plenty we don’t know about the social structure of seals. This is because they spend so much of their time in the water. We do know that they use plenty of sounds for communicating with each other. Further research will hopefully give us additional insight one day to what all of it means for them and their social structure. They are definitely fascinating in many ways though. That includes their social structure and how they are able to keep it structured even though from the outside it may look cluttered and chaotic.